Fabricated in collaboration with the inventors at the Global Coral Reef Alliance, these steel structures are provided a low voltage current which promotes the deposition of calcium carbonate through the process of electrolysis of sea water. Calcium carbonate is used by corals for their skeletons, with the idea corals will grow faster with this technology. These reefs are testing whether a low voltage electrical current encourages coral growth and sustained coral health, and so far the results seem promising. If such projects prove to be successful, the implications for marine conservation are huge. There are two structures on the house reef at Ihuru, and one on Vabbinfaru. The Barnacle project, started in Angsana Ihuru in 1996, was the first experimental electric reef in the Maldives. The volcano shaped steel structure is nearly four metres high and six metres across the base. The second called the Necklace used electricity to grow a reef to help reduce erosion on Ihuru by providing a natural barrier to waves. Since it was submerged in 2001, the calcium carbonate deposits in some areas are up to 40cm in diameter. 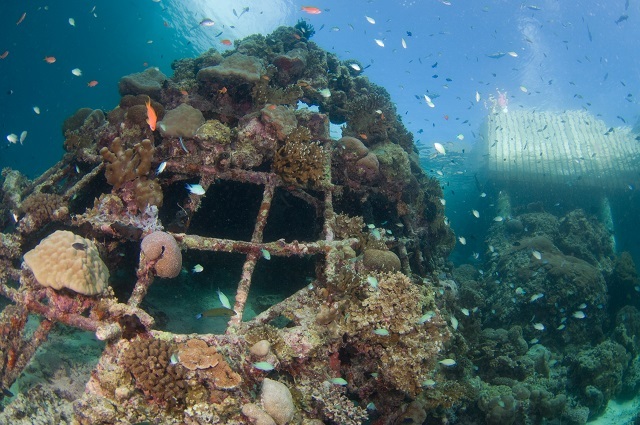 The third, the Lotus, measures 12m across and weighs 2000kgs, was built and sunk on Vabbinfaru house reef in 2001. It took 40 volunteers to carry the structure from the beach to its resting place on the reef. The lotus provides corals and fishes with an ideal nursery habitat and offers divers and snorkelers the opportunity to witness the birth of a coral reef.